Do you feel leeks have become somewhat overlooked of late? Jeanne believes it’s time for trendy 'superfoods' like kale to step aside - we should relish the joy (and health factors) of eating leeks. Discover the rich qualities of the not so humble leek, along with her recipe for a supremely comforting chicken, leek, bacon and mustard bake. Isn’t it annoying when the cool kids get all the attention? You grow up, side by side in the vegetable patch, equally tall and proud; equally green and impressive; and then all of a sudden your neighbour gets catapulted to the heights of superfood stardom, while you languish in the boring essentials category. It’s simply not fair. It’s kale, this, and kale that - it’s a superfood; it can cure everything from athlete’s foot to cancer; every chef from Azerbaijan to Zambia has made kale chips. But what about, the humble and hardworking leek? Ah yes, regard the leek. It’s a member of the alium family which also counts onions, garlic, spring onions and chives among its numbers. It’s never been afforded superfood status, nor has it even had the publicity that onions and garlic have had as promoters of good health. But don’t be fooled - it is similarly well-endowed with flavonoids, folate and antioxidants and let’s be honest: you can eat more leeks than garlic bulbs! Originating in central Asia, leeks arrived in Europe thousands of years ago and were prized by the Romans and Greeks for their medicinal purposes. Leeks were said to have a beneficial effect on the throat and Emperor Nero reputedly ate them on a daily basis to strengthen his voice. Once leeks arrived in the UK (probably brought by the Romans) they quickly became prized vegetables because they could withstand the cold winters and still produce edible plants. But it is in Wales where the leeks reached the height of their recognition and were adopted as the country’s national emblem. This is thought to date back to a battle against the Saxons in 1620, during which the Welsh tucked leeks into their caps to help the troops distinguish friend from foe. The Welsh went on to win the battle and leeks became the official emblem of Wales. 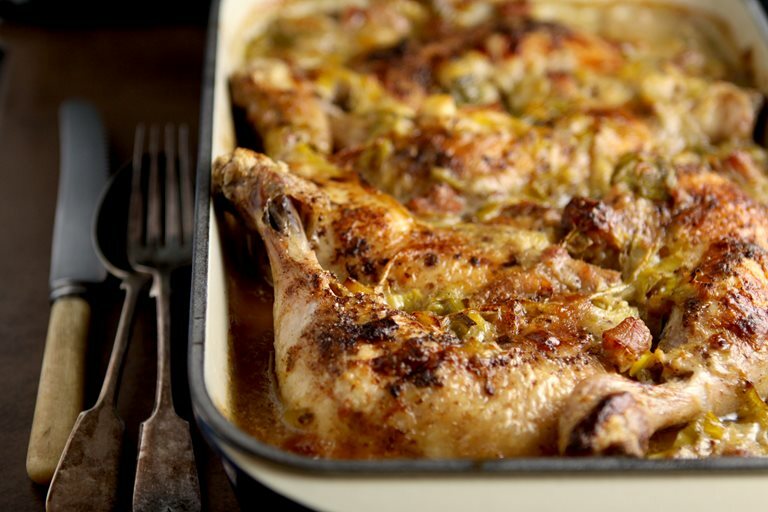 You don’t have to be Welsh, though, to enjoy this easy chicken, leek, bacon and mustard bake. It’s simple to prepare and gloriously comforting to eat on a the chilly summer evenings we’ve been having, paired with creamy potato mash. Add the seasoned flour to a shallow dish. Heat the oil in a large frying pan, dredge each chicken piece well in the seasoned four and shake off the excess. Fry the chicken in the oil, turning until both sides are browned. Use a splatter screen as this bit can get messy! Jeanne is a South African by birth and a Londoner by choice. Her blog CookSister was named as one of the Times Online's top 50 food blogs in the world and is also a four-time winner of the Best South African Food Blog.